Speaking of laptop accessories, it emerged to be laptop battery charger, radiator, mouse and so on. Normally, laptop power cord is ignored by most users. But do you know, it still plays an important act in the laptop. Except for it, any other high-quality accessories won’t help you to transmit power to the laptop. 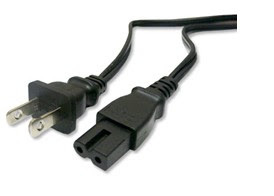 Laptop power cord is a part of laptop battery charger which is composed by plug, cable and interface to laptop. Although it isn’t a kind of precise instrument, it is specially designed for certain laptop models. That is to say, although it seems to be simple, it has taken great responsibility. However, the laptop power cord is weak. Although they are of high-quality materials now, it will be injured easily. Some details which are used in our daily work may have hurt it inadvertently. Please check if you are used to have some habits as follow. First, when collecting the laptop battery charger, have you ever wrapped the ac adapter with laptop power cord? We suggest that it is better to keep it flat at the very beginning of unplug. Second, try not to step on it or make it stuck on any places. Maybe one day, you will find it out of shape or even open circuit. Third, it is dangerous to keep it with the external power supply. As a matter of fact, the power cord also burdens the great power and heat from mains supply and the adapter. Like other electronic products, laptop power cord prefers cool and dry condition. Overheat in ac adapter will have a knock-on effect on it. Furthermore, short circuit and leakage of electricity are very dangerous to users. When it comes to be damage or of a poor contact, you’d better relief it from working. Otherwise, any serious accident is possible to laptop. Of course, you can choose to buy a new replacement laptop power cord or charger according to your requirements.